"Once you get past the size of the figures, though, perhaps the oddest thing about Botero's style is the blank, expressionless looks on his figures' faces. They appear distanced and distracted, providing a tabula rosa upon which viewers can project their thoughts and feelings. There's this blankness to his figures that functions as a kind of mirror," said Don Bacigalupi, a former contemporary art curator for the San Antonio Museum of Art who is now the director of the Toledo Museum of Art in Ohio." To read a fascinating article on Botero, including the words above, please click on the link. There is a notice by the paintings saying that Botero was in Mexico when he saw a circus parading down the street. It wasn't a circus, as in Europe, but a poor circus that reminded him of those he saw as a child in Columbia. It was this that inspired this series of paintings and drawings. Jilly, I went back to the earlier Botero's photo that you posted a few days ago, and after reading the comments, I laughed outloud! Some of them are a hoot! It's interesting to me that the artist has chosen that particular body type as the focus of the paintings. Guess I'll have to Google and think on it a bit more. But, I still think of "food and fasting" when I see the portraits. Jilly, these are great photos. 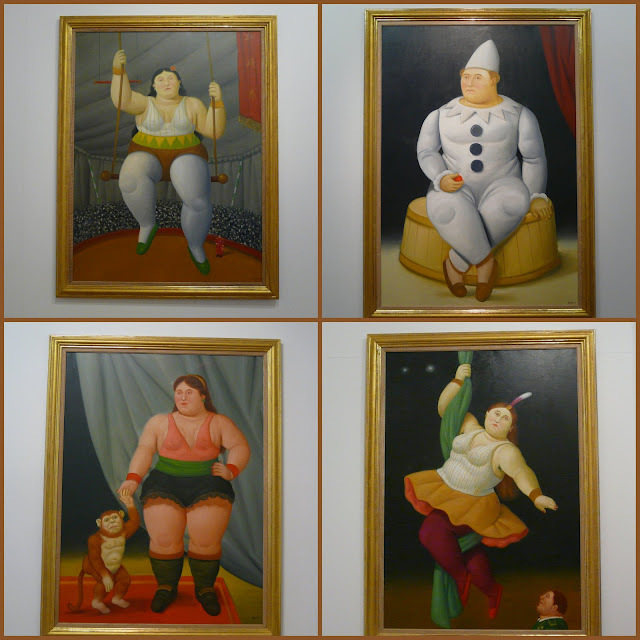 Botero has such interesting artwork and it fits perfectly with the circus series we have all enjoyed through your photos thanks. Where else would you find a robust acrobat but on a Botero painting? Glad photos are allowed at the exhibition! Fantastic works! This is so interesting! The faces are disconcerting in their blankness. FOr me, the lack of expression registers as ennui or sadness.